Octopath Traveler Review - Eight's Great? 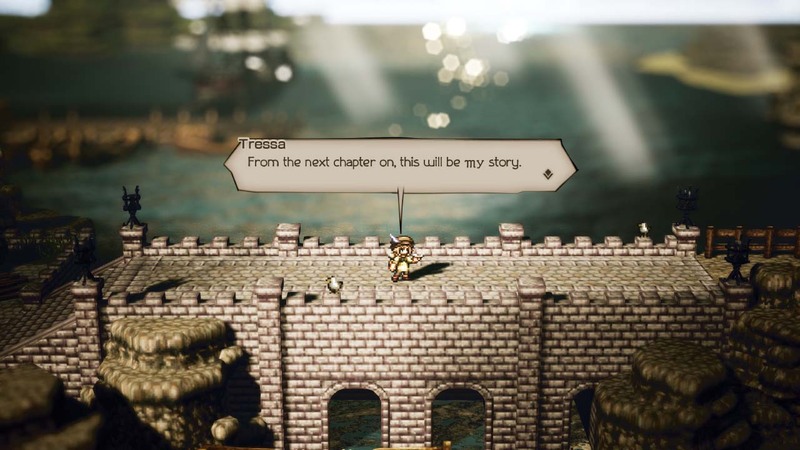 Octopath Traveler Review – Eight’s Great? Despite being a big JRPG fan, I don’t have any nostalgia for that SNES era of RPGs. Sadly, I never owned a SNES at the time, and revisiting the games in later years isn’t quite the same. I’ve always admired detailed sprite artwork, but never really felt a pang of nostalgia when playing those 16-bit throwback titles. And yet, when I saw footage of Octopath Traveler, I couldn’t help be excited. The classic 16-bit art style was reimagined for a modern era, and I couldn’t be more on board. 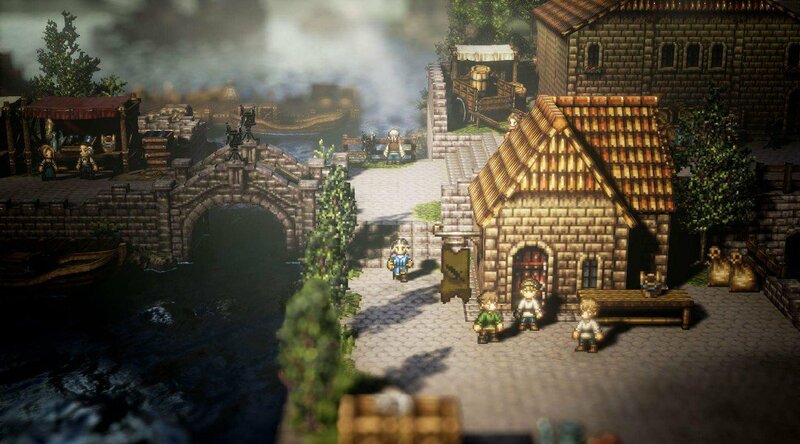 And Octopath Traveler is very much a classic JRPG in more ways than you might expect, for better and for worse. Jumping in you get eight character stories to choose from (thus octo-path, of course) and as you complete their initial story chapter, you can move on and add the next character to your party, until you’re eight strong and taking care of all of their individual quests and goals. It’s nice having such a diverse cast, and it feels like all of the character archetypes from classic JRPGs are here and represented, giving each of them the story perspective of a protagonist, instead of simply leaving them as side characters. The characters having their individual stories, however, is where you will find one of the game’s first pitfalls. It certainly isn’t obvious at first, but the focus on eight individual stories means that there isn’t quite a grand, overarching story arc which binds them all together as you might expect from a JRPG. Instead, it feels like eight distinct side quests that you must tackle, but with no actual meat or grand scale to them, and it’s easy to forget minor details of the individual stories since you have eight to keep up with at once. The story can fall flat, but luckily everything in between is pretty grand, especially the battle system. Taking a note from the Bravely Default series, which development team also worked on, your characters can boost their attacks, either adding additional power to magic attacks or with melee weapons, attacking multiple times. Couple this mechanic with a Break system, where an enemy will become vulnerable and incapacitated once they’ve been hit with something they’re weak against enough times, and you can accurately plan out the pace of the turn-based battles, ensuring your characters are defending, healing and attacking at all the right times. There’s a wide variety of moves too. Not content with your simple mage, warrior and healer class system, Octopath Traveler has more distinct classes for each of the characters, with a lot of room for improvements with upgradable skills, and unique and hidden job classes you can discover at shrines. And of course, all of the game environments look beautiful. The 16-bit art style looks shockingly good in Unreal Engine 4, and the subtle post-processing effects look amazing in portable mode. Though in docked mode, the larger screen real estate makes the post-processing a bit much, in my opinion, while squashed onto a smaller screen it looks crisper and more appealing. Towns each look distinct, and some of the grand views the game attempts look incredibly majestic, offering more impressive vistas than I’ve seen in many high budget full-3D JRPGs in the last ten years. The art style really does work wonders, making dense forests, snowy mountains and vast deserts all feel distinct and somehow believable, in the context of this blocky world. The problem with the world design though is that, again, it harkens back to classic JRPGs. A bit too much, if anything. Areas are linear, leading to one or two areas, with several side paths to wander down and find a chest hiding away. That’s pretty much an apt description of every dungeon, path between towns… Everything. You will either be walking towards your goal, or dipping down alleys to find treasure, all while being berated by random encounters – which are, at least, usually pretty simple to deal with if you know what you’re doing, but I wish the random encounter features from Bravely Default – being able to increase or decrease the speed of battle and random encounter rate – were present in Octopath Traveler. Ultimately, how much you will enjoy Octopath Traveler depends on what kind of JRPG player you are. Are you here for the story and characters, or are you the kind of gamer that loves maxing out stats and dealing massive damage? If it's the latter, Octopath Traveler is perfect for you. If it's the former? Well, sadly, you might get tired of it, but it's still a fun JRPG that can last you for hours.